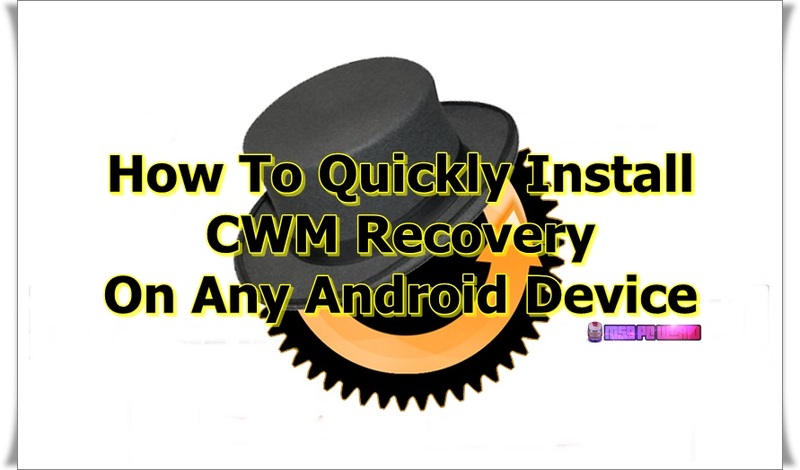 Salaam Friends, In this post you see How to Quickly Install CWM Recovery on Any Android Powered Smartphone and Tablet Device. First, follow us on Social networks for the latest articles and apps & now let's get started. Although CWM recovery is considered a thing of the past, most Android users now prefer TWRP recovery over CWM. Nonetheless, the latter still has a rabid following and loyal users who want to enjoy all the benefits that only CWM recovery offers. In this guide, we are going to show you how to get the latest CWM recovery for Android. If you are looking for a quick, easy method to install a custom recovery image – CWM recovery can be used to perform the task in a matter of a few taps. You can use instructions in this guide to install CWM recovery on both Android phones and tablets. So, let’s see how to install CWM recovery and start Android customization with the easy-to-use tool. There are a few things you need to have in your possession before starting the CWM installation process. Also, before you start, read the following instructions to know what it means to have a custom recovery on your Android device and how it works. A custom recovery works only on a rooted Android device. Therefore, your device must be rooted in order to install CWM recovery. Installing a custom recovery on your device void the warranty. So, proceeding known full well that it will null and void your device warranty on the spot. Another thing you should be aware of is most Android device come with a stock recovery pre-installed on them but it lacks the features of a custom recovery. So if you want to accomplish more, a custom recovery is your best bet. You can use a custom recovery to flash zip files from SD card like custom ROMs. Moreover, you can use it to perform device maintenance tasks, factory reset, wipe data and cache, backup and restore firmware and apps, hard reset device to resolve serious issues and lots more. If you have been asking yourself why I need a CWM recovery and what it can bring for you? Well, to let you know, the CWM or Clockwork Mod Recovery is (or rather used to be) one of the popular Android custom recoveries. You can download and install official version of CWM recovery from Google Play Store which works on the majority of the Android-powered devices. CWM offers great performance enhancement capabilities to ensure the smooth running of your Android device. After reading all this, you have decided to go ahead and install CWM recovery on your smartphone or tablet, then follow the installation process but not before knowing what CEM recovery does for your Android device. Please check beforehand whether your Android device model is supported by CWM because not all Android phones/tablets work with CWM recovery tool. Backup all important data of your Android device before flashing CWM recovery. Backup messages, apps, data, call logs, account information, and everything else that’s important to you. CWM recovery works only on rooted Android devices. Make sure your device is rooted. For installing an unofficial version of CWM recovery you will need to have access to a computer and a USB cable to connect your device to PC Windows or Mac. Make sure you have downloaded a stable version of CWM recovery. This could end-up bricking your device if you don’t follow the instructions properly. We will neither be responsible for any damage to your device, so follow the steps carefully. Visit the CLICK HERE Link and install the app. Select Flash CWM recovery on the pop-up menu. You can then use options on the recovery menu to perform various operations. To access CWM recovery, power off your device and boot it by pressing a combination of physical keys on your device (mostly its Power + Volume Up + Home keys on Samsung device, users of other Android devices can refer to device’s manual to learn what key combination works on entering device into recovery mode). Wrap Up. Once you are done performing whatever you wanted to do in the CWM recovery mode, reboot your device back into the normal mode by selecting reboot system now from the main menu of the recovery mode. Well done, you have successfully installed CWM recovery on your Android device.